Fall into a curious, wonderful world with Alice, who sits content and surrounded by butterflies in this delightful Personality Pose. In Jim Shore's signature folk style, Alice's classic outfit is embellished with beautiful patterns and flourishes. The Disney Traditions Alice In Wonderland Curiouser and Curiouser Statue by Jim Shore is made of stone resin. 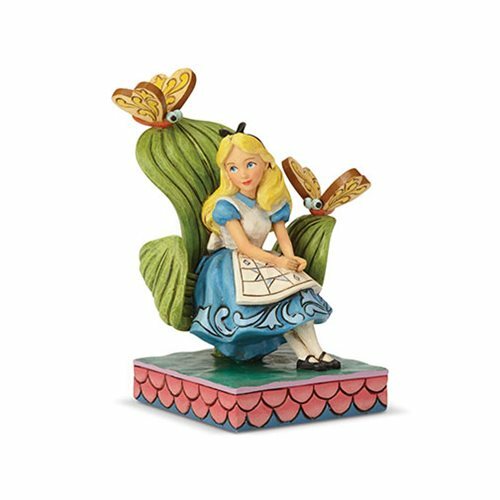 This statue is a must have for fans of Walt Disney's classic Alice In Wonderland film. Measures about 5 2/5-inches tall x 4 1/10-inches long x 3 9/10-inches wide.